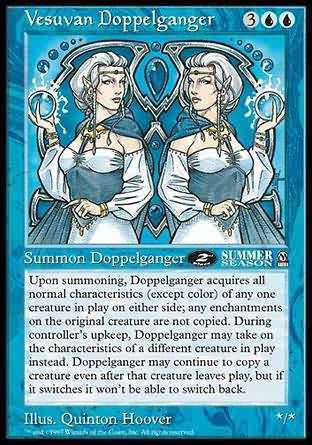 Upon summoning, Doppelganger acquires all normal characteristics (except color) of any one creature in play on either side; any enchantments on the original creature are not copied. During controller's upkeep, Doppelganger may take on the characteristicsof a different creature in play instead. Doppelganger may continue to copy a creature even after that creature leaves play, but if it switches it won't be able to switch back. As Vesuvan Doppelganger comes into play, you may choose a creature in play. If you do, Vesuvan Doppelganger comes into play as a copy of that creature except for its color and gains "At the beginning of your upkeep, you may have this creature become a copy of target creature except for its color. If you do, this creature gains this ability."